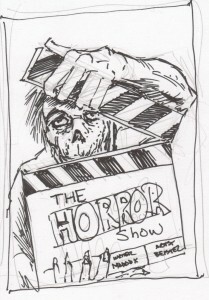 What you see here is a cover sketch for my new short comic The Horror Show with Todd Beistel! Todd shot me this sketch when we were brainstorming cover ideas, and I loved the concept immediately. Can’t wait to follow this post up with the actual finished cover, because it is effin’ amazing!